A new IBM (IBM) consumer study , released Jan. 13 at the National Retail Federation's annual convention, hints that the battle between brick-and-mortar retail and online merchants has entered a new phase. And what's precipitating the shift should come as little surprise: showrooming. 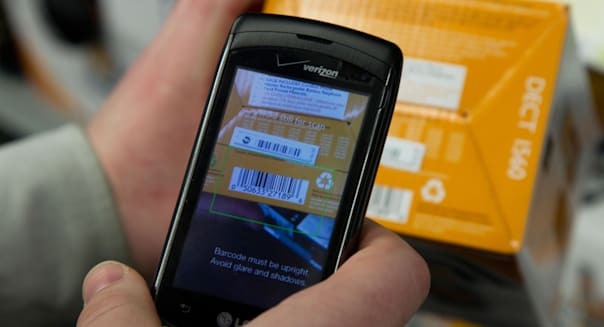 "Showrooming" -- where customers make a pit stop at a store to try out a product before ultimately buying the item for less money online -- has become the bane of many retailers' existence. They've seen sales volumes and profit margins eroded by the relentless discounts on Amazon.com (AMZN) and at other major e-tailers. 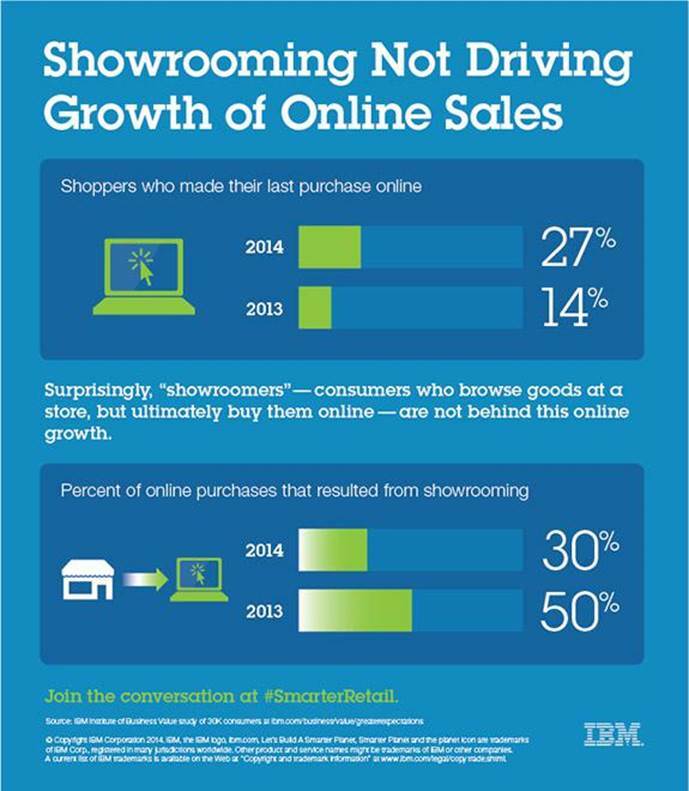 Now IBM reports that fewer online purchases are being made as a result of showrooming. It may seem like a small thing, but there's a lot more happening behind the scenes that's helping to level the playing field between online versus in-store shopping. Retailers, who have long relied on low sticker prices to lure in bargain hunters, are now going the extra mile to beat low-overhead e-tailers at their own game. There's a new dynamic playing out in strip malls and stores across the country. Customers, armed with information culled from Internet product searches, are now pausing before leaving the store empty-handed. That's because brick-and-mortar retailers are becoming more open to bargaining directly with consumers over the price of many items. Shoppers can get the best price and instant gratification. A recent New York Times report supports this idea of retailers going all out to get customers to spend their cash in the store. The Times notes that at least 1 in 5 big-box retailers will match prices found online, even if they don't advertise that fact, and a few -- most notably Best Buy (BBY), which publicized its price-matching policy this past holiday season -- will sometimes even undercut online prices. All consumers have to do is negotiate. This is great news for the American consumer, who now has more opportunities than ever to pit revenue-hungry retailers against one another to offer them the best deal for their precious shopping dollars. %VIRTUAL-article-sponsoredlinks%All a consumer needs is a proper toolkit -- in this case, a smartphone with a good data connection (nothing is worse for the savvy bargain hunter than the loss of connectivity inside a big store) and a suite of apps to compare prices, find deeper discounts, and help you negotiate once you've found what you want. A quick Web search for a specific product will often pull up a list of online storefronts offering it. But you needn't stop your bargain hunt there. Information is a powerful bargaining chip, particularly when it comes to high-ticket items like electronics, furniture, or major appliances. Salespeople and their managers are increasingly trained and encouraged to negotiate with customers to ensure that the purchase gets made. Here's an example of how the strategy worked for me: When I went to my local Bed Bath & Beyond (BBBY) earlier this month to find a proper set of cookware for my new apartment, I discovered that Amazon had the best set listed for $200 less than the store price. It didn't take much effort to convince store management to match that price and even ship it for free from the nearest store with available stock -- though they didn't seem particularly happy about it. But what if you can't find a much better deal online? You can still haggle. If Amazon had offered the set of cookware for only $20 cheaper than Bed Bath & Beyond's price and no other e-tailer was offering a lower price, I would have asked for a price $40 cheaper than that found in the store, with the aim of bargaining my way back to at least a $30 discount. If they weren't interested in this arrangement, there are still other options -- a recently launched site called Greentoe (it's not yet available as an app) lets consumers negotiate on big-ticket products from the comfort of their own homes. If your local retailer won't accept your offer of 10 percent below the sticker price person-to-person, they might accept it from you through Greentoe, and you might even get 15 percent or 20 percent off if you time your offer right. The proliferation of shopping options, along with a similar explosion of shopper-empowering tools, has made this one of the best times in living memory to be a consumer. Take advantage of what's available and you might save hundreds, or even thousands, of dollars each year. Motley Fool contributor Alex Planes holds no financial position in any company mentioned here. Add him on Google+ or follow him on Twitter @TMFBiggles. The Motley Fool recommends Amazon.com, Bed Bath & Beyond, and RetailMeNot. The Motley Fool owns shares of Amazon.com and International Business Machines. Try any of our newsletter services free for 30 days.